We provide comprehensive and reliable technical support for business meetings, congresses and conferences. We have comprehensive technological and technical solutions, as well as equipment dedicated to technical support of conferences and congresses. Our staff is able to implement these solutions reliably. We take care of appropriate sound, lighting and event setting. We document in detail the course of event in professional cooperation with the best photographers and graphic designers. We provide and support: conference systems, rostrums, audio and video systems, event recording and streaming, simultaneous interpreting equipment and almost unlimited solutions in the field of event lighting. 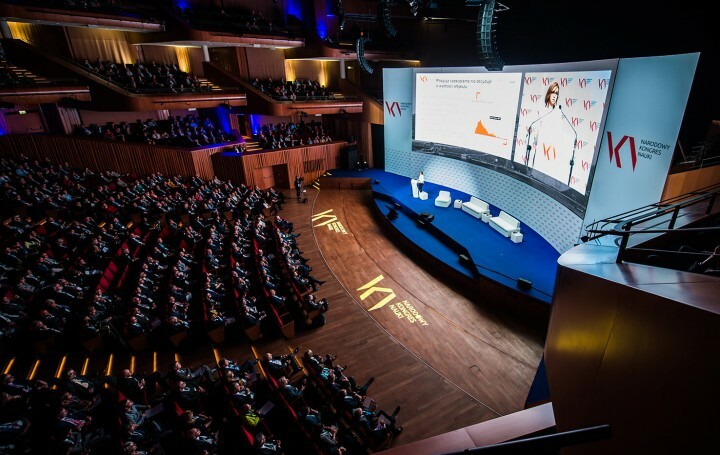 Our current experience with comprehensive services for conferences and congresses – whether in Warsaw or Monaco – shows that it is not only important to provide efficient, strictly technical support. It is also important to take care of the smallest details, which form a coherent whole of the project. It is extremely important to feel the atmosphere and the main idea of event, and to adapt the scenery or lighting to it. All this in order to make the realization of such an event at a level that makes the main topic of meeting almost tangible. While our conference and congress staff can take care of the well-being of guests, their integration and fun, the technical staff will take care of an undisturbed and efficient course in terms of sound, lighting, scenography arrangement, and even video recording and streaming. Regardless of the task you set for us, our goal is always the same… Success! Before you decide to engage CMA as a technical support for your event, check out our Portfolio. Our story is a series of successful events, which we had a great pleasure to work on as their technical support. Technical support for CMA conferences and congresses is a harmonious team of people with endless ideas on how to improve the technical sphere of an event. All this in order to delight the guests and keep your event in their memory for a long time after returning home! It doesn’t matter if you’re realizing an interesting topic of a big event, an intimate conference related to the anniversary of your company’s establishment or a specialized scientific congress. Even the most boring business meeting, we are able to turn into something very interesting. We have been doing it effectively for 20 years.